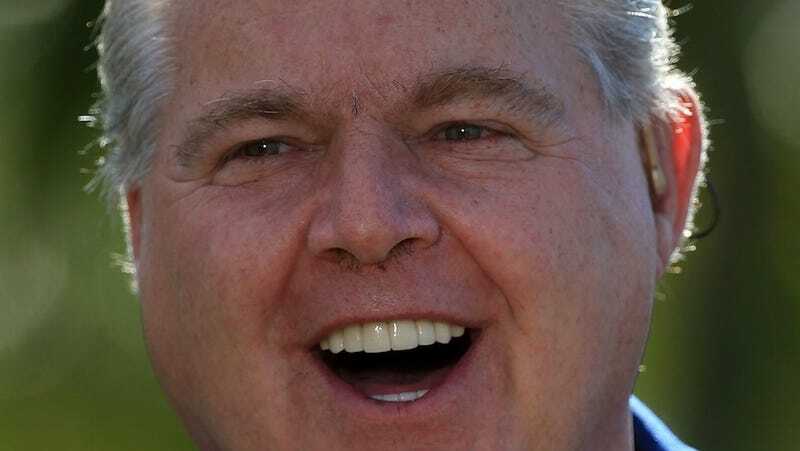 Today in great theories from reasonable people who always arrive with at level-headed conclusions: Rush Limbaugh believes that the Obama administration is refusing to close U.S. borders to countries suffering from the Ebola epidemic because he wants us all to get sick as a punishment for slavery. Sounds like a solid theory! "Liberia came to exist because of American slavery," Limbaugh told a caller on his radio show, in an attempt to explain the (imagined) liberal mindset. "And since they fled to this country to escape the bonds of slavery and they set up Liberia — if it hadn't been for us — they wouldn't now be suffering from this virus." "The danger we have now is that we elected people in positions of power and authority who think this or think like this in terms of this country being responsible, this country being to blame for things and it's that kind of thinking that leads to opposition to shutting down airports from various countries." Limbaugh also referred to Sierra Leone as a country founded by "British African American slaves," so clearly, we should be heeding his advice on all geopolitical matters. A recent survey by the Pew Research Center finds that 58% of U.S. adults are confident that our government will be able to prevent a major Ebola outbreak. Only 11% are very worried that someone they know might contract the disease. Ignoring this information, Rush Limbaugh continued to assert that the left wants everyone to get sick as a means of reparations (never mind that most Ebola victims have been people of color) and returned to his favorite hobby of enslaving a bikini-clad Princess Leia.